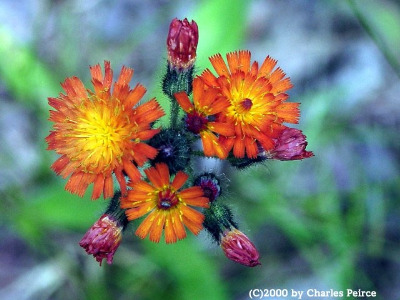 Occurs almost everywhere: can be colorfully abundant along roadsides and in dry fields, but also invading logged areas, forests, shores, moist pastures, marshy ground, and cedar swamps. Apparently introduced from Europe as a garden ornamental in Vermont by 1875, and soon spread throughout northern New England and beyond. 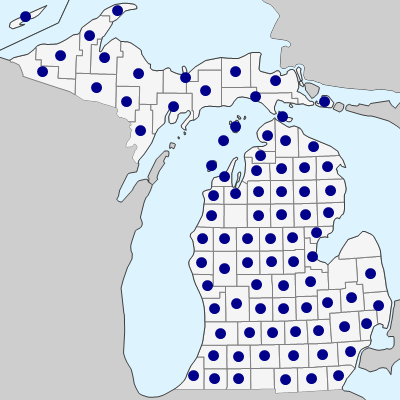 The first Michigan collection is from Alpena Co. in 1895, and it spread rapidly in that part of the state; there are also reports from Lenawee Co. in 1897 and Kent Co. in 1901, so the species may have been introduced ± simultaneously at more than one place in Michigan. Hybrids with H. piloselloides occur occasionally where both parents are found and can be recognized by the intermediate shade of the ligules and/or by bicolored ligules (red apically, yellow basally). The bicolored aspect is, if anything, intensified in herbarium specimens several years after they were dried. Hybrids with ligule color closer to one of the parents are more likely to be keyed as that parent unless the collector has carefully described the situation on the label. Also, ligules of H. aurantiacum tend to be paler in plants growing in shade. Morphological characters are not very helpful in confirming hybrids. Specimens at least temporarily identified as hybrids are known from Alcona, Alger, Benzie, Cheboygan, Delta, Kalamazoo, Keweenaw, Lenawee, Luce, Mackinac, Schoolcraft, and Washtenaw Cos. A collection from Iosco Co. with bicolored ligules may be H. aurantiacum × H. caespitosum, with very broad, hairy, denticulate leaves. MICHIGAN FLORA ONLINE. A. A. Reznicek, E. G. Voss, & B. S. Walters. February 2011. University of Michigan. Web. April 21, 2019. https://michiganflora.net/species.aspx?id=363.